An obvious testimony to his shredding talents, but also to his sensitivity and broad perspective. Long gone are the days when cross-genre recordings and combinations of elements from the two distant sides of the musical spectrum used to leave the audience in a state of shock. These days, we can safely assume there isn't a musical hybrid we're not used to. It has to be admitted, however, that the seemingly uneasy alliance between Rock/Metal and Jazz is particularly charming and it doesn't really take much, or to be a sophisticated Jazz-oriented music lover, to find it enjoyable. A Finnish guitarist and composer, Jartse Tuominen, seems to be aware of this fact as his new album 'Untold Stories' blends both genres in style – and there is even more to it than that. 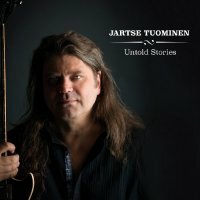 The tracks on '...Stories' are expressive and elaborate, each of them leaving much space, not only for Tuominen's shredding, which is the obvious driving force behind the album, but also some other interesting instrumental passages (such as the percussion solo in 'Hybrid Fusion'). The Jazz influence is indeed prevailing and it is easy to be abstracted within tracks such as the aforementioned '...Fusion', 'Yeah Right' or 'Simppa Goes To Töysä', but nevertheless it is not dominant. On the album there's also a place for guitar-driven, catchy melodies ('Mesa') or captivating, dramatized pieces of instrumental balladry with strong cinematic potential to them ('Time To Go', 'Untold', 'Farewell'). There are also other flavours to Tuominen's music – a certain passage in '...Töysä', for instance, gravitates towards Classical music, whereas the short but intense 'Trouble Shuffle' draws heavily from Fusion, Blues and old-school Rhythm & Blues. In 'Nine Lives' Jazz and Blues blend into a fascinating mixture, which brings back the vintage sound aesthetics of the seventies. Overall, the album is cohesive but without one dull moment; a perfect balance between coherence and stylistic variety. Jartse Tuominen might not be a name recognized worldwide but it is undeservedly so; not only does he manage to deliver an expressive, exquisite performance as a guitar player, but also genre-wise he comes up with very interesting combinations. This makes 'Untold Stories' an obvious testimony to his shredding talents, but also to his sensitivity and broad perspective. You may be a fan of guitar-oriented Rock, Jazz Rock or Blues – it doesn't really matter as you'll enjoy at least a few "stories" on this album either way.